Fourth Row Center: Film Writings by Jason Bailey: In Theaters: "The Hurt Locker"
The Hurt Locker is a very good movie that comes agonizingly close to greatness, but doesn’t quite trust its own instincts enough to close that gap. I’m hard-pressed to recall the last time I was so thoroughly involved with a picture, so wrapped up in the events on the screen before me; the entire first hour is relentless, tightfisted filmmaking—it’s hard to watch in places, the anxiety is so agonizing. But it goes a little slack in the second hour, filling in blanks that we don’t want filled and over-explaining things that we admired it for leaving alone. The filmmaking is messy and spontaneous; you wish the screenplay didn’t wander into such predictable places in the second and third act. The setting is Baghdad, 2004. In a dangerous and turbulent place, perhaps the most hazardous job is to work on the army’s bomb squad, finding and disabling car bombs and IEDs in the war zone. The squad works in a three-man configuration: a tech/team leader and two sharpshooters who protect the tech while he works. In Bravo company, a new tech, Staff Sgt. William James (Jeremy Renner) has joined Sgt. JT Sanborn (Anthony Mackie) and Specialist Owen Eldridge (Brian Geraghty) for the last 38 days of their rotation. James immediately rubs them the wrong way with his reckless hot-dogging (and lack of apology for it—Sanborn’s complaints are met with a slap on the shoulder and an off-hand “It’s combat, buddy”), but he’s good at the job, even if he’s putting their lives in danger along with his own. Screenwriter Mark Boal and director Kathryn Bigelow parachute us right into the action with an exquisitely-constructed opening sequence of unbearable tension and suspense. In all seriousness, it blows you back in your seat. That, and the numerous diffusion sequences that follow, are beautifully executed; Bigelow (whose credits include everything from the underrated Strange Days to the dunderheaded Point Break) never holds a shot too long, but her scenes are never choppy, either—the technique is invisible and seemingly effortless. No scene is quite like the others; she’ll find a little detail (like a wiper scraping across a dry windshield) Boal’s dialogue is swaggering and jargon-heavy; it is reminiscent of the recent (and excellent) Iraq mini-series Generation Kill, and that show’s refusal to traffic in dull exposition and obvious sign-posting. In this script and in that one, they assume you’ll figure it out as they go along. As a result, the first hour of The Hurt Locker is something of a revelation: we’re witnessing the establishment of characters almost entirely through action. And I don’t just mean “action” in the things-blowing-up sense; I mean that we get to know and understand these people entirely through what they do, to themselves and to each other, and not so much from what they say, but the way they say it. We observe the fascinating interplay between the three men in the most high-stress situation imaginable, and that tells us all that we need to know; it’s an incredibly cinematic method of conveying exposition and character information, and in conventional action cinema, action and characterization is usually an either/or proposition. This kind of terse, efficient storytelling is crisply accomplished in, say, the calm, quiet scene where James and Sanford slowly but surely take out attacking insurgents with a long-range weapon, or the maddening sequence in which the telltale signs of a literal ticking bomb slowly assemble around the kill zone. As a result, it’s a little disappointing to arrive at a scene midway through in which the three men get drunk and tell each other their secrets. This is conventional storytelling, and the film had tricked me into thinking it was going to eschew that kind of thing; this viewer, for one, was hoping that Boal’s script was going to take the kind of straight-forward, no-explanations approach that Michael Mann flirts with so intriguingly in Public Enemies. The realization that Boal and Bigelow feel like they have to explain these guys is an unfortunate one that loosens the taut grip of the film’s first act; it gets worse at the film’s conclusion, in which a character is forced to explicitly state what Bigelow’s elegant visuals of the previous moments have made abundantly clear. In some ways, I was hoping that Boal was going to casually subvert the psychological shorthand, the way that the film takes some standard elements of war cinema (the sympathetic but detached war shrink, the local kid who our hero takes a shine to) and turns them on their head. But he doesn’t; the flawless direction and Renner’s brilliant performance (seriously, you can’t catch this guy acting) tells us everything the dialogue does, and you wish they’d trust us to have picked that stuff up without the extra shove. This is not to say that there still isn’t greatness in The Hurt Locker, even in that second half; the performances are spot-on, those diffusion sequences are downright excruciating (but, you know, in a good way), and there’s a strange, dreamlike quality to a late scene where the trio investigates the aftermath of a bombing. I’ve never been one to complain about the handheld camera, but I will admit that I was feeling a little wobbly by the end of this picture. Then again, it probably wasn’t just the camerawork. 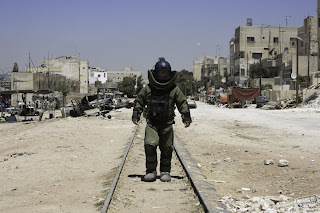 Even with its flaws, The Hurt Locker is still a must-see work. "The Hurt Locker" is now playing in limited release.